Sangiran is an area located in the foothills of Mount Lawu, about 17 km north of Solo, Central Java. Administratively the Sangiran area is part of the Regency of Sragen and Karanganyar covering an area of 56 square kilometers. Around 900 thousand years ago, Sangiran was a newly formed land. The remains of the waters territorial still exist in the north of the Kendeng Mountain foothill in the remains of the vast lagoon in the Solo Concave. The land was formed due to the faulting and folding of the earth, volcanic activities of the mountains around it and low tide of the surface. Sangiran is well-known as the site of prehistoric human fossils and cultural artifact treasures. What is most amazing is that the past life of humans is evident complete with illustrations of the environment, i.e. the floral, faunal and geological conditions. In their stratigraphic exposures, various chronological episodes of prehistoric life two million years ago are recorded neatly in Sangiran’s ridges. Afterward of the sea ebbed forever in the area. The natural environment of Sangiran changed, from aquatic environment to continental. Along with the world climatic change at the time, marshy forests gradually replaced the mangroves until it eventually became continental plants. The plants in the plains and hills also changed their nature. During drier period, open forests occurred since the vegetations were able to adapt to the hard dry season, while in humid period dense tropical forests occurred. At the time, there human life had already existed in Sangiran. 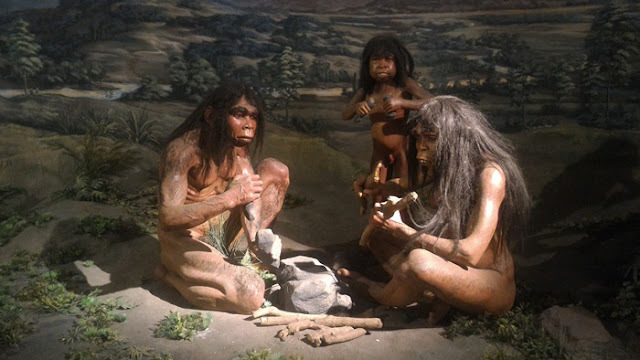 Homo erectus that lived along the bank of prehistoric Bengawan Solo river, might had first arrived in the island of Java around 1.5 million years ago during the formation of the land bridge in the Ice Age. Later, around 900,000 years ago, was the height of their residency in Sangiran. This new environment had actually provided them with enough sources of flood. Fruit plants as well as bulbous plants were abundant around them. They could also hunt for big and small animals found in the dense or open forests. Some kind of animals that had existed then among which were : elephant (Stegodon sp. ), rhinoceros (Rhinoceros sp. ), hippopotamus (Hippopotamus), boar (Suidae), monkey (Macaca sp. ), buffalo (Bubalus palaeokerabau), bull (Bibos palaesondaicus), and deer (Cervidae).